A member of The Academy submitted this photo and caption. The following picture was taken in Buffalo, N.Y. during the Academy's 2009 tour. We had a free day at Niagara Falls the day before and many of us went on the "Maid of the Mist" boat ride which goes straight into the falls. 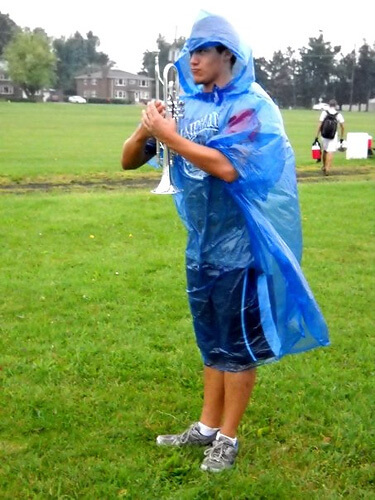 This is four-year Academy trumpet vet, Eric Gonzales, who knew we'd need our "Maid of the Mist" ponchos the next day during a stormy rehearsal.